La celebre fish shoe di André Perugia é stata presentata a New York nel settembre 1955, insieme ad altre nove scarpe, nella collezione ispirata da altrettanti artisti celebri. C'era anche il sandalo Picasso (da non confondersi con il sandalo cubista). E questo é un dato certo e verificabile. 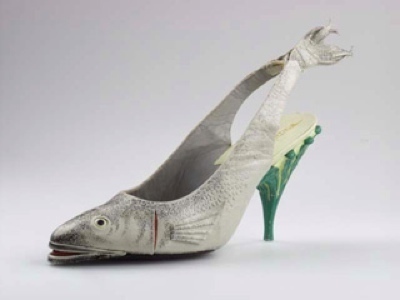 The famous André Perugia fish shoe was showcased in New York (September 1955), along with nine other shoes, as part of an art-inspired collection. The Picasso sandal was also featured (not to be confused with the cubist sandal.) And this comes from a verified source. A collection of shoes inspired by the work of famed artists, the work of Andre Perugia, noted Paris shoe designer, is currently being shown in the U.S. Mr. Perugia is associated exclusively with I. Miller in this country, and his "fantasy" shoes are patterned after the works of modern masters. 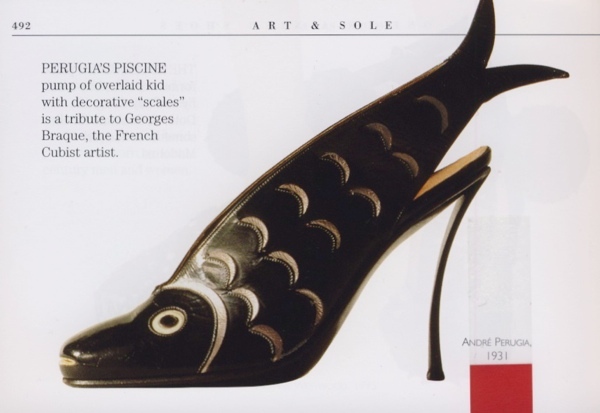 A noted collector of modern French paintings, the designer feels that there is a close relationship between fashion and art and the 10 shoes which are in a size which can be worn by live models, are a living example of what he means when he says, "Fashion is art; and this is my way of painting." 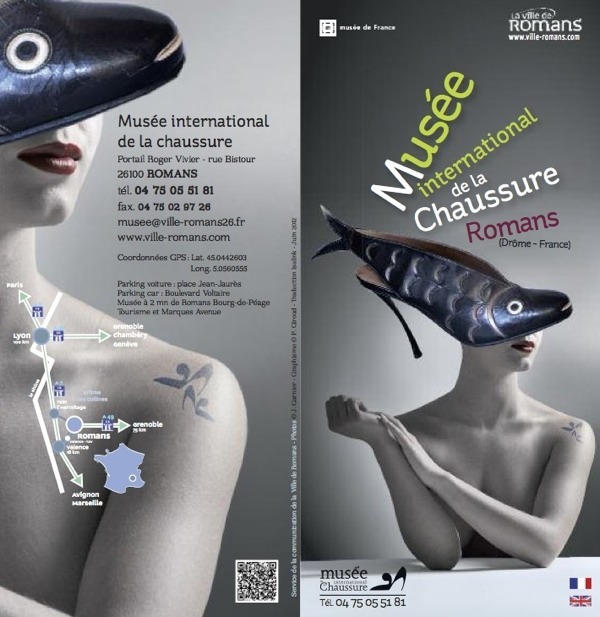 …five colors, all clashing "exquisitely," like the canvasses of Henri Matisse are featured in a high-riding silhouette model and a fantastic shoe in the form of a fish, executed in gunmetal patent leather shaped into fish scales reflects the work of Georges Braque. Forget the 1931: did you ever see such a heel in the Thirties? Perugia era un mago, ma neppure lui avrebbe potuto disegnare un tacco simile nel 1931: la tecnologia di allora non lo permetteva. Come spesso accade, la rete ha replicato all'infinito una datazione errata, molto probabilmente quella riportata nel libro "Shoes", peraltro utile, di Linda O'Keeffe. Qui dimostriamo perché, in ogni caso, la data NON poteva essere il 1931. Perugia was like a wizard but the technology was just not there to come up with such a heel. Like many things on the net, a mistake was endlessly replicated without control; most likely the flawed source was the - otherwise useful - book "Shoes" by Linda O'Keeffe. So, please find here a couple of reasons why anyhow the date could NOT be 1931. Come si vede, la fish shoe é essenzialmente il sandalo del 1951 carrozzato da pesce. 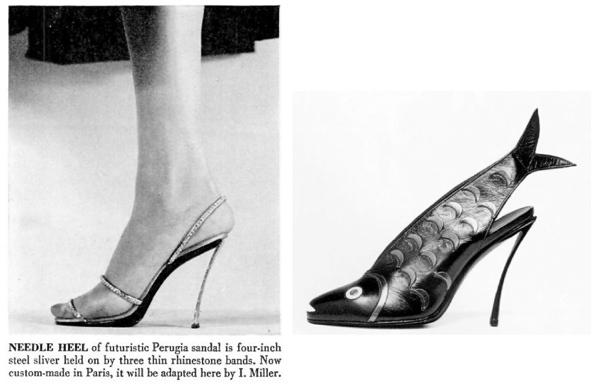 Il design della scarpa (tacco incluso) é un brevetto del 1951 realizzato nello stesso anno da André Perugia per I.Miller. 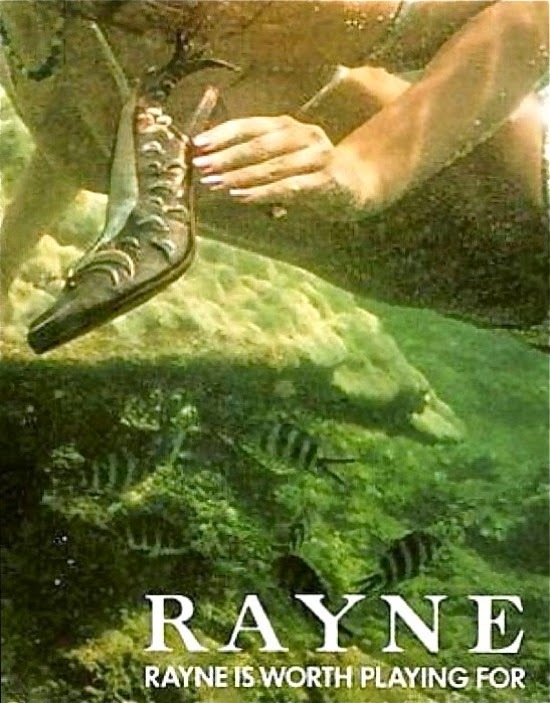 As you can see, the fish shoe is basically the 1951 sandal customized. 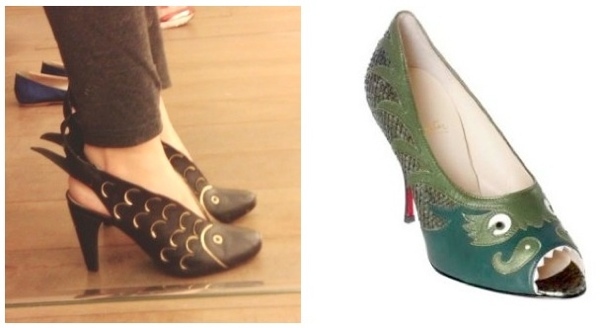 The shoe design (heel included) is a Perugia patent from 1951 put into production by I. Miller the very same year. 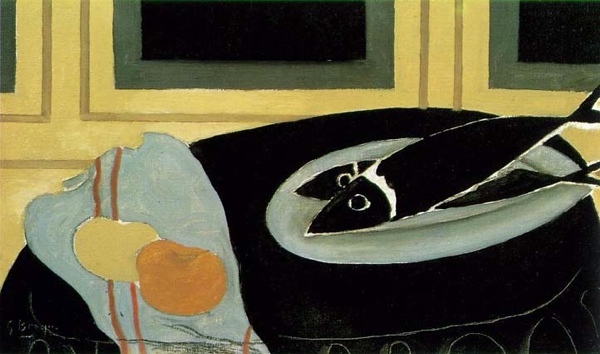 Per il pittore francese Georges Braque i pesci sono stati un motivo ricorrente tra il 1941 ed il 1942 in almeno tre dipinti. Li ha poi ripresi nel 1951 con il quadro "The Aquarium" e nel 1955, ma prima del '41 non ha mai disegnato pesci. Quindi, PER ASSURDO, se la datazione del 1931 fosse vera, si tratterebbe di un omaggio di Braque a Perugia e non viceversa. - la fish shoe NON é del 1931. - ultimo punto, ma non meno importante: se per caso avete notato la data di pubblicazione di questo post, sappiate che NON é un pesce d'aprile. 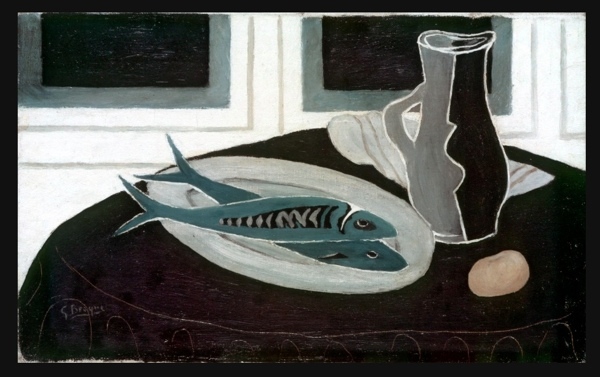 The fish were a recurring theme for French painter Georges Braque between the year 1941 and 1942 (three paintings at least). The fish can also be spotted in the years 1951 (a work called "The Aquarium") and 1955. Meaning, a 1931 shoe can't be a tribute for something painted ten years later. Can it? - last but not least: if you noticed the post's date - mind you - this is NOT an April's fool. Pur senza elaborare, l'unica a porsi il dubbio di una datazione imprecisa é stata Inge Specht, curatrice museale olandese, sul blog My Favorite Shoes. Dopo aver visto la scarpa Arthur (Schoenen Museum di Waalwijk, Olanda) ha immediatamente pensato a quella di Perugia ma non riusciva a spiegarsi come quest'ultima potesse essere definita un omaggio a Braque. To my knowledge, the only one skeptical about the 1931 date was Dutch museum curator Inge Specht. After seeing the Arthur shoe at the Schoenen Museum (Waalwijk, Nederland), she wrote a post on the blog My Favorite Shoes: the 1967 Arthur shoe reminded her of Perugia and asked herself about the Braque thing. I brasiliani di Amapo hanno realizzato un'intera collezione basata sul modello di Perugia, senza peraltro dichiararlo. QUI ne riferisce Anna Battista/Irenebrination. Brazilian brand Amapo produced a whole collection based upon the Perugia model (without due credit of course). HERE the report by Anna Battista/Irenebrination. I haven't found anything to prove the connection except that in 1984 they made a reproduction of the fish shoe.